VIP Records are proud to present DJ Raj, Jagtar & Dav Juss’ brand new Mashup Cover of the hit singles “Kangna” & “Pyar Kiya To Nibhana” entitled “Love Bangles” Available for FREE DOWNLOAD!! Amar Hayer releases his debut single entitled Gabhru featuring production from Dav Juss! 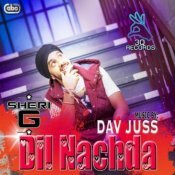 Sheri G releases a brand new single featuring Dav Juss called Dil Nachda! ARE YOU Dav Juss? Contact us to get a featured artist profile page.